NEXT-proaudio has added to its Subwoofer options, the LAs418 2x4ohm a new version of the current subwoofer LAs418. Housing two long excursion and very high power 18″ drivers, this Subwoofer has been designed to offer ultra-low frequencies at a very high SPL delivering magnificent precision and punch at incredible pressure levels. The cabinet volume with optimized port tuning featuring extremely high peak-to peak excursion capability, is capable to deliver true sub performance down to 24Hz at -10dB. 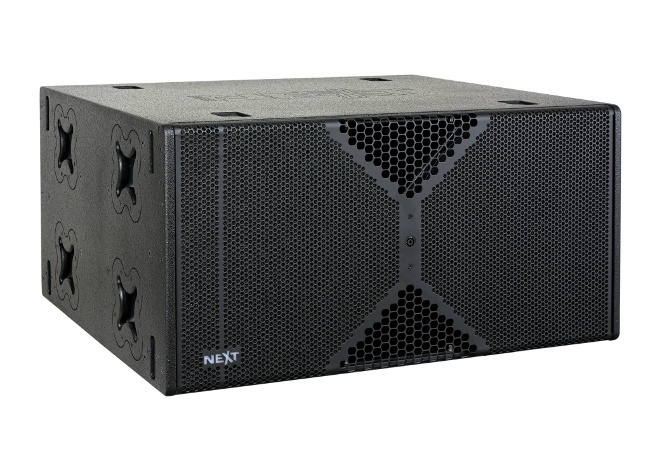 Providing low frequency resolution and a maximum SPL of 143.8dB in a 94kg, front loaded, bass reflex enclosure and measuring 516mmx920mmx1030mm (HxDxW), the new subwoofer version incorporates 8 handles and rigging system. Both X4 and X8 from Powersoft can provide 5200W per channel at 2ohm, in addition to a DSP-controlled Switch Mode with Power Factor Correction (PFC) reducing harmonics and improving the efficiency, driving effortlessly 2-ohm loads. The X Series natively supports AES3, analog inputs and two optional Audinate Dante digital streams, providing up to four different selectable input sources per channel. NEXT-proaudio has developed and is already supplying an updated touring Power rack with Powersoft X Line amplifiers, offering to the customers a worldwide standard, LA Rack, to use in both rental and install. The new LAs418 2x4ohm is available for order immediately.